[Updated 5/18/17, 4:01 pm. See below.] Manure is an inescapable part of farming, and it can be an expensive and messy one at that. Large animal farms produce so much waste that it must be stored in tall piles or deep lagoons. If storms spill that waste or it somehow seeps into the groundwater, farmers and communities find themselves scrambling to clean it up. Agtech startup PrairieChar aims to transform manure from a cost center into a profit stream. The Lawrence, KS-based company has developed technology that “deconstructs” manure, turning it into sterile products that have applications in the soil and fuel markets. Because manure is heavy and expensive to move, CEO Bob Herrington says the key to PrairieChar’s approach is bringing the technology to the manure pile. PrairieChar was the winner last week of the Ag Biotech Entrepreneurial Showcase, an annual event hosted by the North Carolina Biotechnology Center that draws agtech startups from across the U.S. and around the world. PrairieChar was voted the winner for its machine, assembled near where manure is stored, that converts animal waste into two products. PrairieFood is a soil amendment that the company describes as a “super food for soil microbes.” PrairieFire is a fuel that Herrington says is comparable in energy content to sub-bituminous coal, a type of coal burned mainly in power plants and industrial operations. 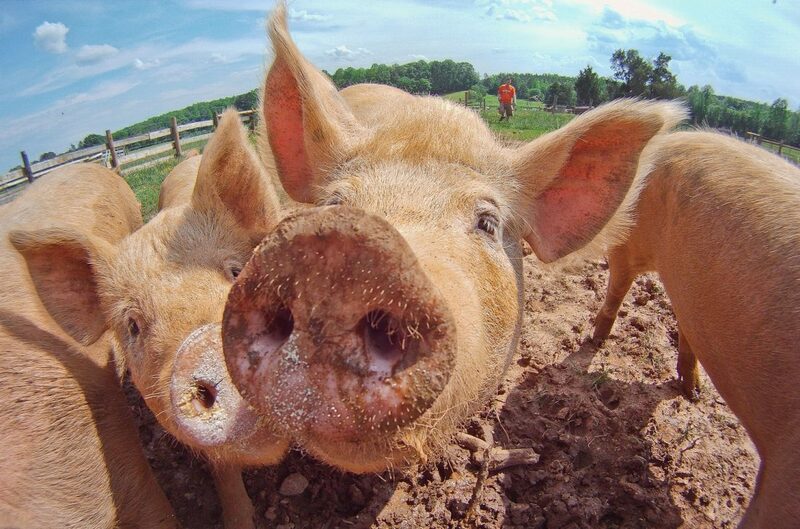 The PrairieChar technology could find a ready market in North Carolina, which the National Pork Board ranks as the nation’s number two state in hog and pig inventory. Much of the waste produced by these farms is stored in large lagoons. Herrington says PrairieChar’s “wet process” works well with swine manure. He adds that the company already has orders for its product and the company has secured some commitments for a Series A round of financing targeting $5 million [Paragraph updated to clarify that the funding round is still underway]. As the showcase winner, PrairieChar was awarded a $10,000 cash prize. The company will also receive in-kind services from the accounting firm Hughes Pittman & Gupton and law firm Smith Anderson. Second place went to another Lawrence-based company, Integrated Animal Health (IAH). The startup’s lead product is an anti-diarrheal drug for cattle. Up to 25 percent of calves can get sick from diarrhea, but farmers don’t know if the cause is viral or bacterial, says president and CEO Blake Hawley, who is also a veterinarian. IAH’s Scour Mate binds to gut toxins, regardless of the source of infection. IAH has also developed a canine version of Scour Mate. Scour Mate was originally a treatment for dysentery in children—a small market. Hawley says IAH aims to find other overlooked human health products that have the potential to find wider use as treatments for animals. Other products that the company is developing include a repellant for fleas and ticks, and an edible heartworm medication for dogs. IAH is currently raising a $5 million round of funding to support its research and development efforts. IAH’s second-place prize was $2,500 cash. —Agribody Technologies. San Diego-based Agribody is using genome editing to boost crop yields, improve how plants hold up to environmental stresses, and lengthen the shelf life of food. The company is using the CRISPR-gene editing system to edit two genes in order to change the levels of a protein that has a role in whether cells grow and divide, or die, says Jerry Feitelson, the startup’s CEO and co-founder. The company’s technology is based on research from the University of Waterloo. The company has also licensed CRISPR gene-editing technology from Benson Hill Biosystems. Feitelson says Agribody’s long-term goals include partnering with large seed companies. In the meantime, the startup is raising $1 million in seed financing to support its research. —Applied LifeSciences & Systems. Consumer and regulatory pressures are pushing the food industry away from using antibiotics in poultry. Vaccines can reduce the need for antibiotics, but current methods can’t effectively deliver the vaccines to all chicks, says Ramin Karikpour, founder and CEO of Applied Life Sciences & Systems. Spraying vaccine misses some chicks and injecting each one manually is too labor intensive. The Raleigh, NC-based startup is developing a system that Karikpour says can effectively deliver vaccines to individual chicks. Applied Life Sciences & Systems is aiming to raise $4.1 million in a Series A round to continue its research and development work. Karikpour says he is also looking to partner with a large poultry company. —Apse. St. Louis-based Apse has developed a way to make genetic changes using a natural biological process. Apse’s approach blocks RNA, a molecule that acts as a messenger carrying genetic information. RNA interference (RNAi) can be used to block the expression of specific genes, which has potential applications in herbicides, antivirals, and insecticides, according to Patrick McLaughlin, Apse’s director of molecular biology. McLaughlin says Apse’s technology offers costs savings and efficiencies compared to other RNAi methods. The company’s lead product candidate is an insecticide targeting fire ants. Apse is raising $3 million in funding. —BioCHOS. Though farmers can keep fungal diseases in check by applying chemicals to their crops, fungi are developing resistance to many of the products now available. Norway-based BioCHOS is developing a fungicide CEO Berit Bjugan Aam says will be safer for the environment. The fungicide is made from a compound found in crab shells. BioCHOS has begun pilot-scale production of the fungicide, called AgriCHOS, and Aam says the company has conducted field trials. AgriCHOS will need regulatory approval before entering the market but Aam says the fungicide could launch in three years. —Biotality. As consumer demand for organic food grows, Tom Christensen says the need for crop protection products that meet organic standards grows, too. Biotality, formed by Durham, NC accelerator Ag TechInventures, has rights to an organism that produces a substance that kills fungi. The company’s initial focus is developing a seed treatment for the organic foods market but Christensen, Biotality’s founder, says the compound could have applications in conventional agriculture as well. Biotality is working with IR-4, a federal research program that supports the development of crop protection products for specialty crops. —Boragen. As BioCHOS noted, fungal resistance is a growing problem for the agriculture industry. Boragen aims to develop a new fungicide based on the element boron. The Research Triangle Park, NC-based company was the first investment of AgTech Accelerator, which joined in a $10 million Series A round of funding. John Dombrosky, CEO of both the accelerator and Boragen, says that the startup’s lead fungicide candidate will have a novel mode of action compared to fungicides that are already on the market. But he says that fungicides are just the start. The company’s technology platform, he says, could also develop other applications for boron. —Edison Agrosciences. The fungal disease that devastated rubber production in South America is now threatening rubber trees in Southeast Asia, says Matt Crisp, chairman of Creve Couer, MO-based Edison Agrosciences. Edison aims to produce rubber from a different plant that naturally produces small amounts of the raw material—sunflowers. By genetically engineering sunflowers to increase their natural rubber production, Crisp says the plant could become a domestic source of the material. Edison has raised $800,000 in seed funding to support a pilot study. Crisp says that the company plans to raise up to $5 million in a Series A round next year. The company will also seek partnerships. —NeuroCycle Therapeutics. Dogs scratch. But too much scratching can lead to lesions, or worse. NeuroCycle Therapeutics is developing an anti-itching drug that works in a different way than itching drugs that suppress the immune system. Instead, NeuroCycle’s drug candidate works through the central nervous system. Matthew Toczko, chief operations officer for the company, which has operations in Sheridan, WY, and Switzerland, says that because his company’s drug doesn’t suppress the immune system, it can be used in combination with other drugs that do affect the immune system. —Soilcea. The bacterial diseases citrus canker and citrus greening are devastating Florida’s citrus trees. Soilcea is trying to grow trees that can resist them. The University of Florida spinout aims to do that by using the CRISPR/Cas 9 system to remove genes susceptible to the diseases, says vice president and CFO Yianni Lagos. So far, Soilcea has tested a canker-resistant tree in a field trial. The next step is a trial testing a tree resistant to both canker and greening. When Soilcea introduces its trees to the market, Lagos says the company will get a license to the CRISPR technology from the Broad Institute. In the meantime, the company is raising $3 million to continue its research. —Tethis. Plants grow better in soil that isn’t compacted and has the right amount of moisture. One way to achieve those conditions is with superabsorbent polymers (SAPs), materials that can soak up large amounts of water that can be released slowly to plants. Tethis, a Raleigh startup spun out of North Carolina State University, has developed a bio-based SAP from corn starch that could be an alternative to petrochemical-based SAPs. Scott Bolin, the startup’s co-founder and CEO, says that the Tethis SAP can match, and even beat, synthetic polymers, in performance. Bolin says that the technology has been tested in one field trial. Tethis has raised $4.5 million in funding to date. Public domain photo by Flickr user U.S. Department of Agriculture.